As a youngster, the revered director of surf movies, Bruce Brown, was inspired to get his first bike by Steve McQueen’s motorcycle memorable scenes in The Great Escape. Brown turned to the sport of motorcycle racing in 1971. This quintessential motorcycle movie gives a riveting insight on the daredevils who risk life and limb racing week in, week out in deserts, on dirt tracks, ice and tarmac. Brown encapsulates the thrills and spills of motorcycle racing that are sometimes wacky and always dangerous. Brown’s own narrative is enthusiastic and contagious, entertaining and informative. His cinematography is bright, colourful and no less than exceptional when considering that the film was made 30 years ago. Its soundtrack is utterly 70s at its cheesiest worst, although this minor downside adds retro authenticity. 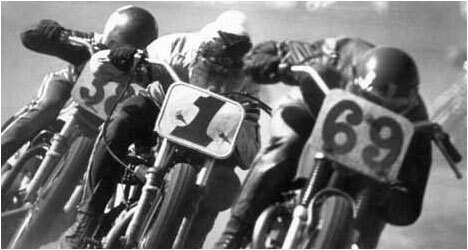 As a passionate motorcycle racer himself, the late great McQueen himself features in several scenes, although his star power was not intended to, and does not, eclipse the subject matter. The film was a joint labour of love for both Brown and McQueen, who contributed funding and support to On Any Sunday’s making. It gained an Oscar nomination in 1972 for Best Documentary Feature. For anyone even remotely interested in motorcycles, it is an absolute must. For those not, it still provides an interesting snapshot of its time. It continues to stand tall as a 70s classic and now has the well deserved opportunity to become a newly rediscovered classic for another generation. Additionally, the special On Any Sunday Collector’s Edition is accompanied by On Any Sunday Revisited. This extra feature is an all new classic created by Brown and his son, Dana, also a film maker. It is an exciting bonus that has been especially released to mark the 30 year anniversary of the original movie. and DVD press releases via email.